I spent last weekend in the Eastern Sierra enjoying fall colors. It was a very delightful, although windy and cold, trip. Late Sunday afternoon, while I stopped at the gas station in Lee Vining, a few snowflakes started falling down. A storm system was moving into the Sierra. Since I didn’t want to cross 120 during a snowstorm, I headed home before sunset. Lo and behold, there was a notice at Yosemite’s eastern entrance announcing Tioga pass road’s closure for 7pm. Good thing I didn’t stay. Only when I arrived at Olmsted Point, it was then too tempting not to wait the 20 minutes or so until sunset time. I enjoyed the moving clouds and the scenery while having a little snack, protected from the elements, in my car. Sunset itself wasn’t very exciting. However a few minutes later, Half Dome was illuminated by alpenglow. It wasn’t very strong and it only shone on part Half Dome’s face. But together with the colors of the sky and the heavy clouds, it makes for a very pleasant image. Wanted to acknowledge your photography and composition skills somewhere, so just chose this page. They are ALL fantastic Daniel. I must tell you how much I like your image of Half Dome with Alpenglow. I’ve seen and admired Ansel Adams images of Half Dome and still consider them yardsticks by wich to measure technical know-how and artistic sensitivity. 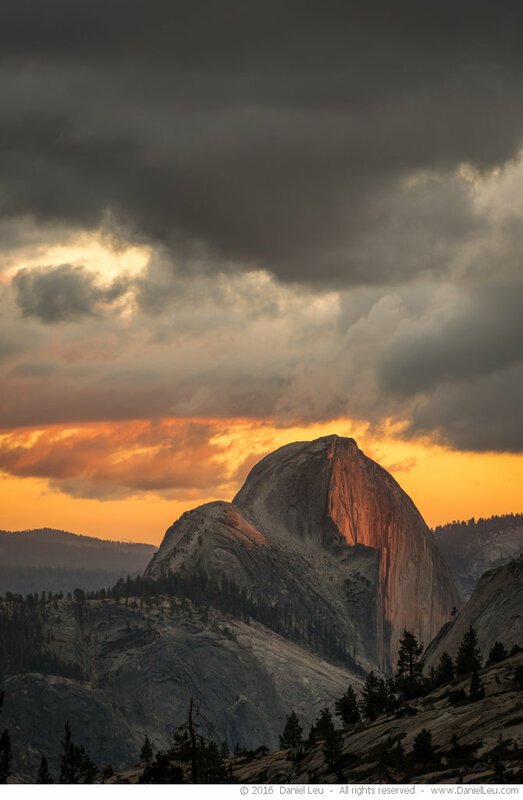 Your color image of Half Dome is, for me, in the same league. Thank you for sharing and keep up the excellent work. Thank you for your kind words, Pierre! For a long time, it looked like sunset would not happen. Then suddenly for a few minutes, there was the Alpenglow on Half Dome. I’m happy that I stayed and waited.